What a delightful treat this was for breakfast this morning. Rich, creamy, and full of flavor and good nutrition. The peanut butter I consumed in college wasn’t organic, which I recommend now, but surely better than cafeteria food and Ramen noodles. I made this smoothie without any add-ons. Next time I’ll be adding cacao to experience that chocolate and peanut butter synergy. Enjoy! 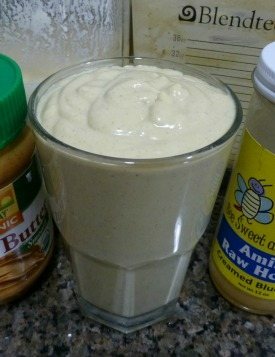 I’d love to know if you try this peanut butter kefir smoothie – please leave a comment below. Happy Blending! It’s a bit different than smoothies I’ve tried before, but I like it. I did add extra peanut butter and some 60% cacao chips. I’ll make it again.